Cooks Who Care: A Monthly Service Project – . I enjoy keeping up with the bake and blog of “Cooks who Care” at cookswhocare.com. These ladies are selfless, giving, and patriotic. The founder, Susan called on her fellow cooking friends online to make and send home-baked goodies to our troops overseas once a month. At least 1,000 blogger/bakers like me make treats and ship them to deployed military persons each month. It’s called “Operation Baking GALS.” Incidentally, this service activity has also stirred up some insightful conversations during our family Bake-offs. Conversations with my son and nephew have included: the war against terrorism, our president, our military troops, and giving of one’s self to others, volunteering, Tithing, Selfishness, and many more issues. Perhaps an even better benefit is that we have received letters from our brave military recipients, who write us from a far away and quite dangerous environment. The grateful attitude spills out in these letters like no other! The soldiers indicate to us in these letters that nothing touches the heart like something home-baked from the States! What a terrific life lesson! 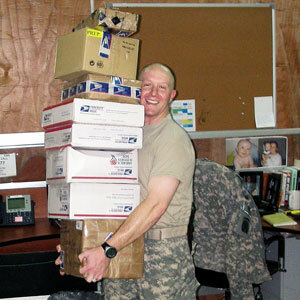 If this type of service would interest anyone reading this, please go to cookswhocare.com and sign up to send some goodies to a brave soldier. What a Blessing you will be!